Bring water to a boil; add shrimp and cook 3 to 5 minutes. Drain Well; rinse in cold water and chill. Peel and devein shrimp. Pour 1/3 cup chile vinegar over shrimp; toss gently. 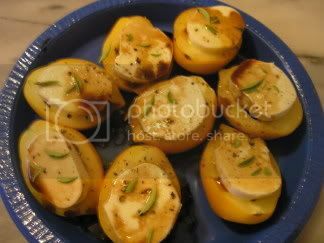 (recipe below) Pour 1/2 cup chile vinegar over jicama; toss gently. Arrange tomato slices and tomatillo slices on individual salad plates; top evenly with jicama mixture. Place shrimp mixture over jicama mixture. Pour remaining chile vinegar over salads. Garnish with fresh cilantro sprigs. Combine all vinegar ingredients in a medium mixing bowl; stir with a wire whisk until well blended. Combine the first 7 ingredients; whisk into oil. Gently toss with remaining ingredients. Marinate at room temperature 1 hour or several hours in the refrigerator. Serves 6. Place bulgar in a bowl and cover with boiling water; stir. Cover bowl and let stand 20 minutes to soften. Add lemon juice, parsley, mint, scallions, and plum tomato to bulgar and toss to combine. Dress salad with extra-virgin olive oil, salt, and pepper to your taste. To serve, cut tomatoes into quarters, but do not allow knife to go all the way through the tomato. Section tomatoes, but leave skin intact on the bottom. Open tomato up to resemble a flower. Season with salt and pepper and pile a generous amount of tabbouleh salad on top of tomato, allowing salad to spill down and over tomato onto plate. Cook to al dente 2 cups of pasta twists (Rigatoni type). Drain and rinse with cold water. Let sit for 30 min, then add pasta and combine well. just before serving, cube some fresh mozarella cheese and sprinkle over servings of the pasta salad. Finish it off with a generous covering of fresh grated Parmesan Reggiano. This also works great with a mix of large tomatoes and Sungolds and Mexico Midgets! decorative it would look if you used different coloured cherries. 1. Cut cherry tomato in half. 2. Thread half one cherry tomato onto toothpick, cut side facing inwards. 3. Thread small round of buffalo mozzarella slightly smaller than the diameter of the cherry tomato onto toothpick. 4. Thread remaining half of cherry tomato onto toothpick cut side facing in, forming a little red-white-red tomato sandwich. 5. Assemble in a circle around a white place. Sprinkling with finely sliced fresh basil, sprinkle with extra-virgin olive oil, salt flakes and fresh-cracked black pepper. Served with a little napkin. With a flute of French champagne at anchor these little insalata shooters went down a treat. A great idea for entertaining. I'm going to make a platter as Christmas hors d'oeuvres. I apologize in advance if this picture is still huge. I did try to re-size it before submitting but for whatever reason, I'm not seeing an edit function above so I tried editing it in photo bucket first. Still learning, bear with me. My experience with this tomato, grown for the first time last year, was that it's somewhat hollow, which makes it great for stuffing. It's not a really large tomato but it works well for small bocconcini balls (fresh mozzarella). Cut tomatoes in half and scoop out seeds. Put a small fresh basil leaf in the bottom of the "tomato boat", followed by a half bocconcini ball (~2" sized ones work well). Drizzle with balsamic vinegar and extra virgin olive oil. Sprinkle with salt and freshly ground pepper. Serve as a first course. We grew Minette bush basil so we sprinkled the tiny leaves of that on top as well. Wow Sorellina. This is my kind of appetizer. This dish would be great cold, grilled or broiled in the oven for a few minutes. Yes, Angelique, I think you're right, it would be nice grilled. We haven't had it that way before, but I've made an appetizer of bocconcini wrapped first with prosciutto and then with radicchio, braised in olive oil and then drizzled with balsamic, finished with salt and freshly ground pepper. It's braised just until the mozzarella "weeps" a bit out of the radicchio, then you know it's melted. Way yummy. Yes, try this grilled and let me know. We're not growing Wonder Lights this year. Grub, I like your take on the Caprese Salad also. I was just thinking that if you threaded a smallish basil leaf onto the toothpick, you'd have the entire Italian flag right there. I think kids would enjoy these as well (sans Champagne..maybe San Pell and orange juice for them). In a large bowl, combine asparagus, tomatoes and pine nuts. In a small bowl, blend together garlic, vinegar, Dijon mustard and olive oil with a fork or whisk. Pour dressing over vegetables, season with salt and pepper and toss to coat. Cook bacon over medium heat in large skillet for 15 to 18 minutes, until crisp, spooning off fat and juices as they accumulate during cooking. Remove bacon from skillet; drain on paper towels. Discard drippings. Place mayonnaise, sour cream, basil, vinegar, seasoned salt and garlic in blender container. Cover and blend until basil is well combined. Layer lettuce, tomatoes and onion in large salad bowl. Evenly spread mayonnaise/basil mixture on top; sprinkle with bacon. Cover and refrigerate for 1-4 hours. Meanwhile, heat oven to 450 degrees F. Melt butter in large skillet. Remove skillet from heat; stir in olive oil. Add bread cubes and toss until coated. Spread bread cubes on baking sheet and bake for 10 minutes, until lightly toasted, stirring once halfway through during baking. To serve, add croutons to salad; gently toss until lettuce is evenly coated. Season to taste with pepper. Prepare pasta according to package directions. Drain and rinse under cold water. In a large bowl, combine the rest of the ingredients, along with pasta. Salt and pepper to taste. Whisk together all ingredients, except sliced tomatoes, in a small bowl. Place tomatoes in a container. Pour marinade over tomatoes, cover and refrigerate for at least 1 hour before serving.